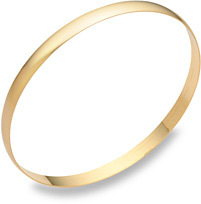 Gold bracelets for women are among the jewelry staples that should be a part of every woman�s wardrobe. Apples of Gold�s gold bracelets for women are all crafted from top-notch 14K yellow gold�in other words, this isn�t mere costume jewelry! These are lasting pieces that will retain their beauty year after year, making them investments as well as statements of your sense of style. Read more. 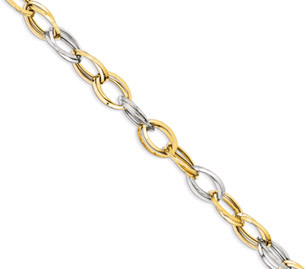 Rope bracelets are true classics and when they�re crafted from 14K gold, they�re able to serve as elegant accents no matter what�s trending at any given time. 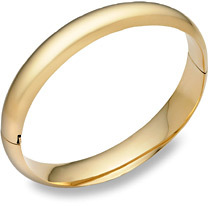 Apples of Gold carries a range of widths, allowing you to choose a slender, subtle number, a bold, wide bracelet or anything in between. No matter what size best suits your personal fashion sense, you�re sure to have a piece that projects a pulled-together, polished look. 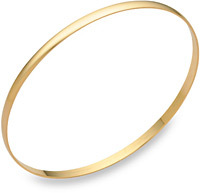 Bangles crafted from 14K gold portray a perpetual sense of glamour that takes any outfit up a notch and their polished finish is always an excellent choice. 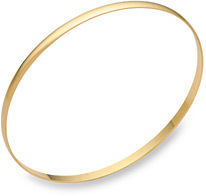 Slender gold bangles add a sense of lighthearted class, whether worn solo or in a group; however, if you�d prefer a more daring hit of golden shine, consider a wide design that draws attention and adds a sense of style that�s outgoing and upscale. 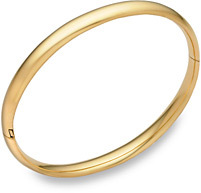 In addition to classic flat bangles, Apples of Gold carries several hinged bangle bracelets that slip on and off with ease. Or, choose a less traditional take on the bangle, such as a unique twisted look or an intertwining design. These fashionable pieces provide a big dose of stylistic punch and add a fun touch of personality to any outfit. 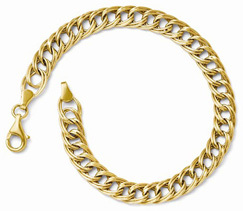 Unique links give a fresh look to a number of gold bracelets for women. From styles with a woven look to designs that resemble golden intertwining Celtic knots, these pieces are able to take any outfit up a notch. 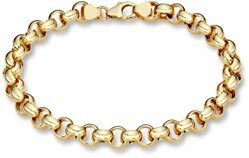 Charm bracelets have long been feminine favorites and gold bracelets for women with dangling charms are always lovely accents. The charm bracelets in this collection are not only pretty; they�re crafted to be suited to pass on to future generations and to remain beautiful for many years to come. 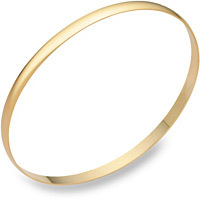 Gold bracelets of many kinds can serve as lovely gifts for women of all ages. Their versatility and timeless appeal will make them much-appreciated pieces for the long term. No woman�s jewelry collection is complete without at least one (or a few!) of them.